T reminds Ss of the sentences in the textbook and asks them to talk about what they learned last class in pairs. With 100 won, you can give a child three bananas. With 1000 won, you can buy a child a meal. With 10000 won, you can send 30 pills to sick children in North Korea. Ss explain to each other the rules of the target structure, dative verbs. Ss are asked to put the ideas they’ve shared together in groups. T checks whether it is correct or not with the whole class. 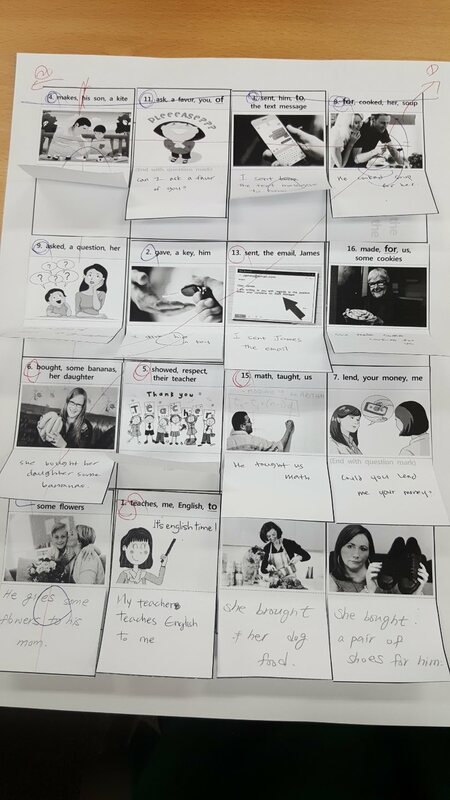 T lets Ss in pairs write the sentences on the picture cards by using the given words(including davite verbs) and pictures. Ss are asked to complete all of the sentence cards for the Bingo game. T lets Ss share and check the answers in groups. T let Ss randomly put the sentence cards in each grid on the board. Ss present and tick the target sentences on the cards in turn. When Ss make 3 or 4 lines, they win the game.